Uva ursi is a Latin name which means bear’s grape. Its botanical name is Arctostaphylos and it is of the Ericaceae family. 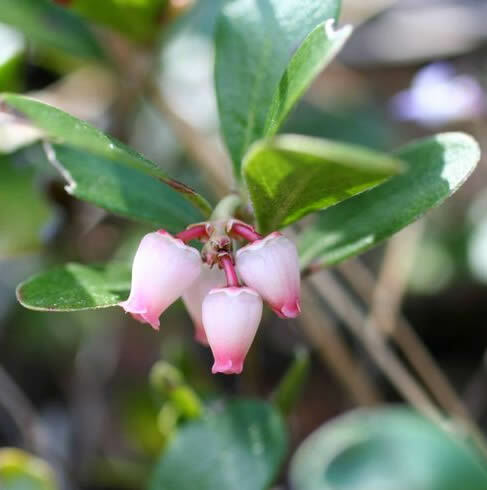 Other common names include bearberry, kinnikinnick (the name given to it by native Americans), whortleberry, spreng, mountain cranberry , and mealberry. It is a low-growing evergreen plant, usually reaching no more than 16 in (41 cm) in height. Growing in the cooler, northern climates, uva ursi likes well-drained sandy soil and a sunny location. It can be found in the mountainous areas of Europe, Asia and America, where it is commonly used for ornamental purposes, mostly as shrubbery or hedging. It is widely found in Canada and the United States, but no further south than Wisconsin and New Jersey. In the British Isles, it is common in the Highlands of Scotland, the hilly areas of Ireland, and as far south as Yorkshire in England. 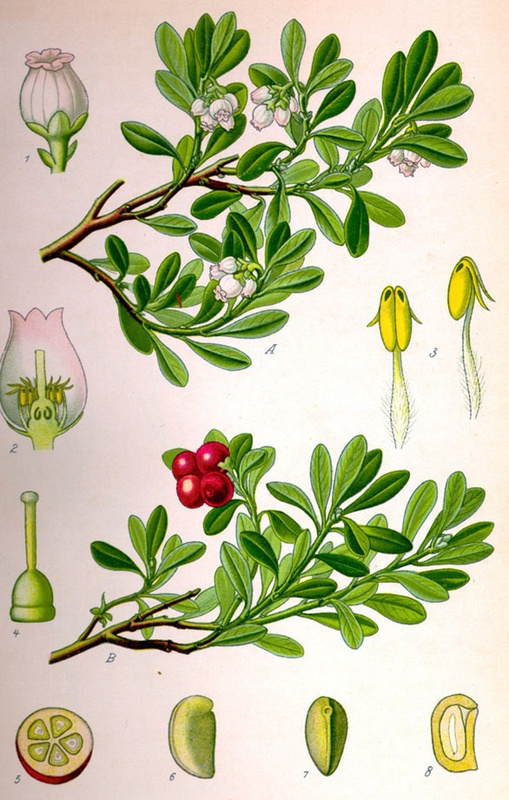 Uva ursi bears many pink or white flowers, which may be tinged with red, and grow in clusters. Bears are known to be fond of its red berries, hence the common name. The leaves, which are the part of the plant used for medicinal purposes, are smooth-edged, leathery, small, (between half an inch to an inch long), and oval. They are dark green in color and have lighter undersides. The leaves have no odor but are to be distinguished by their exceedingly bitter taste. They are attached to the branch by a very short stem. The branches tend to trail, are covered with a light brown bark, and are inclined to form a thick mass one to two feet long. Shoots rise obliquely from the stems and have soft hairs. Uva ursi, which is generally categorized as a treatment for the urinary and glandular systems, was commonly included in all the old pharmacopoeias, where it was sometimes mistakenly named Arbutas, and classified as such. It has also been included in the modern pharmacopoeias due to its many medicinal uses and the fact that modern research has not detracted from the high esteem in which it is held in alternative health circles. The leaves of uva ursi are used mainly for kidney and urinary infections , for which it is exceptionally effective, having both anti-inflammatory and antiseptic properties. It is a famous herbal cure for cystitis, from which most women suffer at some time or another. It is also effective for the treatment of kidney stones, as it acts on these by softening them and has muscle relaxant properties, which may be beneficial in patients with this disorder. Other illnesses for which it has been used include Bright’s disease, dysentery, nephritis, gonorrhea and syphilis, excessive menstruation, stimulation of the spleen, liver and pancreas, hemorrhoids, menopause, and diabetes. Research has indicated that the herb is more effective in its whole state than when broken down into components. Some native Americans combined it with tobacco and smoked it. Its astringent properties make it useful for infections (it dries them up). The tea may be used as an antiseptic for cuts and abrasions. It is sometimes used as a weight loss aid because it promotes production of urine, being an effective diuretic. In some places, notably Russia, it is drunk as a tea. Uva ursi is one of the rare herbs that can be helpful in cases of bedwetting. Uva ursi has such a high tannin content that the leaves have actually been used to tan leather in Russia and Scandinavia. In Scandinavia, an ash-colored dye is made from the plant. 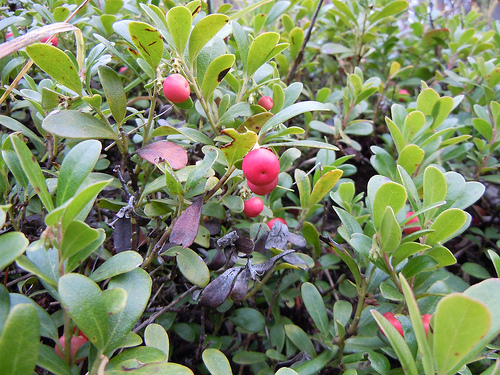 Uva ursi berries are used as food for grouse. The leaves of the uva ursi plant may be harvested at any time, although traditionally this precious medicinal herb is gathered in late summer or autumn. The leaves should be picked in the morning after the dew has dried. They should then be left in a well-aired place to dry naturally and then stored in an airtight container (preferably glass or stainless steel, as these won’t react with the volatile oils) to keep them dry, as they have a tendency to reabsorb moisture from the atmosphere. The hairs, which are present in growing uva ursi leaves, are absent once the herb is dried because they drop off in the drying process. Herbal extracts, as capsules or tablets, 250-500 mg three times daily. Tinctures, (which are alcohol-based), 5ml three times daily. For the purpose of treating urinary tract infections, 6-8 g of bicarbonate of soda in a glass of water should also be taken. This combination ensures alkalinity of the urine, thus releasing the active ingredient from the uva ursi. Another way to ensure alkalinity of the urine is to adhere to a vegetarian diet with lots of raw fruits and vegetables for a period. The leaves may be wrapped in gauze and added to bath water for the treatment of hemorrhoids, inflammations and skin infections. Uva ursi should not be taken for more than two weeks at a time and individuals with high blood pressure should not take it at all. Some practitioners assert that this herb should not be used for more than three days at a time, as it can irritate mucous membranes. Uva ursi may be taken as a tea (infusion) for the treatment of minor vaginal irritations, menstrual bloating, and diabetes. Uva ursi tea should not be boiled, as it becomes bitter and unpalatable and poisonous compounds may result. It is sufficient to prepare an infusion by soaking the leaves for a few hours in cold water. This mode of preparation inhibits the release of tannins that may irritate the stomach lining. Alternatively, boiling water may be added to the leaves, (one pint of water to 1 oz of leaves), which should then be allowed to steep for a while. Some practitioners recommend always combining uva ursi with marsh mallow root or other mucilaginous diuretics. Although high doses of uva ursi are not recommended for long periods, one cup of the tea is permissible as a prophylactic in cases of recurring cystitis. However, it is preferable to discontinue even prophylactic treatment from time to time. 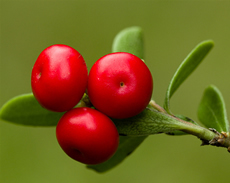 Occasionally, uva ursi is adulterated with other herbs, most notably cowberry and box, which will render the remedy less effective. Care must be taken to obtain the remedy from a reputable dealer. Pregnant women should not take uva ursi. It should not be given to small children unless under the supervision of a health care practitioner. Long-term use of uva ursi is not recommended as hydroquinone (produced in the body in response to uva ursi) is poisonous in large amounts. Practitioners recommend that it be taken for no more than two weeks at a time. Despite the powerful antiseptic/antibiotic properties of uva ursi, a natural health practitioner should be consulted if it is being used to treat infection. It should be noted that practitioners recommend all alternative treatments should be used in conjunction with a healthy lifestyle. Uva ursi has been known to cause mild nausea. Fruit juice, vitamin C, and other acidic foods should not be taken with uva ursi preparations, in order to promote a pH balance in the body, thus preserving effectiveness of the remedy. If a patient develops any of the following toxic reactions that may be provoked by uva ursi, such as nausea and vomiting, shortness of breath, convulsions, ringing in the ears or even delirium and faintness, medical help should be sought immediately. The bicarbonate of soda, which is recommended to be taken with uva ursi in cases of urinary tract infection, is unsuitable for those who suffer from high blood pressure, and in any case should not be taken for more than two weeks. Uva ursi is not recommended for use during pregnancy as it may restrict blood supply to the fetus, due to its astringent properties. Uva ursi should not be taken in conjunction with the herb buchu, and should also not be taken with cranberry or anything containing cranberries. It should also not be used in conjunction with any drugs, which induce acid urine. Uva ursi may temporarily turn the urine green, which is a harmless side effect. Arbutin, which is a constituent of uva ursi, is known to increase the anti-inflammatory effect of synthetic cortisone. This interaction may require a change in dosage.